0-acetyl-2,3-dehydroneuraminic acid followed by treatment with sodium methoxide. The a-hydrido analog was synthesized from jV-acetyl-2,4,7,8,9-penta-0-acetyl neu-raminic acid benzyl ester under the action of hydrogen iodide in acetic acid. In the reaction, the anomeric acetate was converted to an iodide, which subsequently underwent reductive elimination to give the a-hydrido compound under thermodynamic conditions (Fig. 20) . These combined syntheses efficiently provided five new sugar amino acids with functionality suitable for typical peptide coupling reactions. 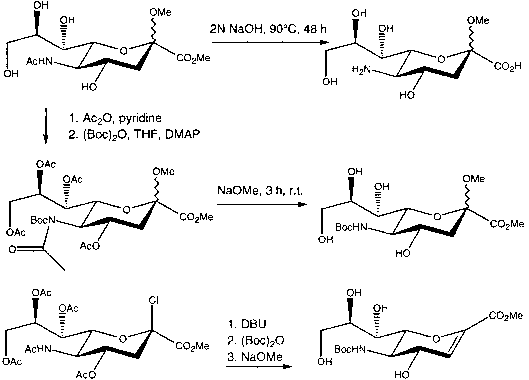 The foregoing synthetic efforts, targeting the design and syntheses of novel carbohydrate-based amino acids over the past 45 years, have established a solid foundation for an entirely new area of scientific inquiry—the use of sugar amino acids in the synthesis of novel and unnatural products.